Republican Congressmen Mark Meadows (NC) and Jim Jordan (OH) sent a letter to Attorney General Bill Barr on Wednesday asking for an update on the DOJ’s investigation and prosecution of former FBI Deputy Director Andrew McCabe. Meadows and Jordan, who are both members of the House Oversight Committee, requested an update from AG Bill Barr stating that the Inspector General referred McCabe’s lack of candor to the US Attorney in DC almost a year ago, yet he still has not been indicted. “McCabe’s pattern of lies to the FBI and OIG officials was particularly troublesome because they were intended to cover up media leaks that would benefit McCabe personally and professionally,” the GOP lawmakers wrote. Andrew McCabe leaked confidential investigation details and information to the media to “advance his personal interests” then lied about to the Inspector General. The Inspector General released a scathing report on McCabe last April stating he “lacked candor” following his illegal media leaks. Meadows and Jordan then say that when confronted whether he was the source of the leak, McCabe “concealed his conduct by lying to Comey and lied under oath” to other DOJ and OIG investigators which resulted in his termination. McCabe was then criminally referred to the US Attorney in DC and a grand jury was impaneled to investigate him. 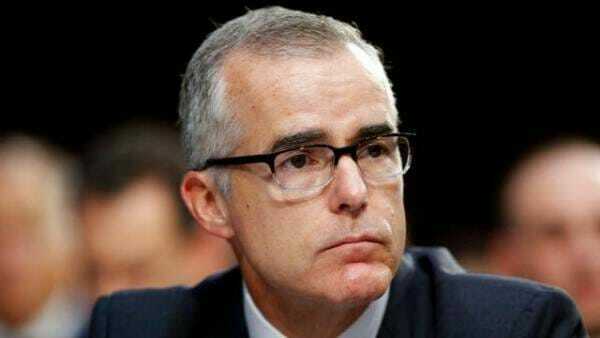 Andrew McCabe was also a part of the coup to remove President Trump from office and opened two inquiries into Trump shortly after the President fired Comey as FBI Director — McCabe opened the two inquiries as revenge for Trump’s firing of Comey, however he claims he was afraid Trump was obstructing justice and acting as a foreign agent on behalf of Russia, even though there was zero evidence to support his outrageous claims. Why hasn’t McCabe been indicted yet?? The post NEW: Reps. Meadows and Jordan Send Letter to AG Bill Barr Requesting Update on DOJ’s Investigation and Prosecution of Andrew McCabe appeared first on The Gateway Pundit.